Calculating employee utilization provides exact information on billing efficiency and productivity of your company. It helps you make better staffing decisions and drive profitability. Total available hours simply means standard number of working hours available during a time period before vacations, holidays, or personal time off. There are lot of debate about what baseline number should be used when calculating utilization. The most general number used in the industry for total available hours available in a year is 2080. This number is calculated by taking the 52 weeks of the year and multiplying them by a standard 40 hour work week. When calculating this utilization, most service companies take very simplistic view and just measure billable utilization. Yet many top-performing services companies take account of other factors, such as non-billable work and may employ multiple utilization measures. Defined as the percent of time spent working on billable tasks. The time spent on internal projects or business development is not included, because this time is not billed from the client. This would be of interest to managers following only the billable employee resources. Take a look at the formula:. Let’s dig in a bit more. For example, if 40 hours of time is recorded in a week but only 28 hours of that was billable, so the utilization rate would then then be 30/40 = 75%. Billable hours / Fixed numbers of hours per week. For example, if 30 hours of billable time are recorded in a fixed 40 hour week, then the utilization rate would be 32/40 = 80%. For example, if an employee tracks 32 hours of billable work on client accounts during a given 40 week, that person utilization rate for week is 80%. The realization measures how much of the time the resource spent on billable work was actually billed from the customer. In this measure non-billable work is not included. This would be of interest for management in measuring the effectiveness of the organization with their billable work. For example, if an employee tracks eight hours of billable time per day but only six of those eight hours are paid by the client, then realization rate is only 75%. Whatever calculation you choose as the right utilization formula for your company, it is critical that you apply it consistently and uniformly across all employees. Calculation should also be simple enough for everyone to understand and use it. What is a good utilization rate? Every service companies should strive for an overall utilization rate of anywhere between 65% and 85% or more. The remaining time would then be spent in non-billable activities such as business development, education, administrative tasks, professional activities and holidays/paid time. Of course, services organizations want to increase utilization rate as much they can, but too high utilization target can lead to potential longer-term attrition problems. Companies don’t want drown their employees in work. At the same time, underperformance can also cause serious financial troubles for a firm. So, companies often set target utilization rates that satisfy both the need to bill time and the need to keep employees happy and healthy. Generally speaking, utilization us a measure of time spent working. 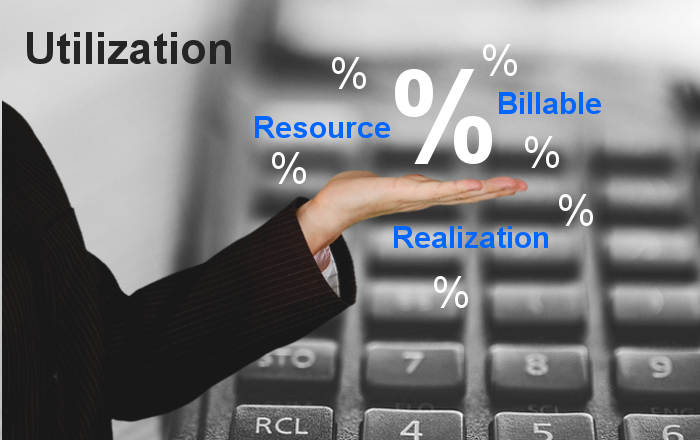 In its simplest form some firms just measure billable utilization. But many advanced services companies include non-billable work and may employ multiple utilization measures. But one thing is for sure, whatever calculation your company choose, it should simple enough to understand and consistently used across all employees. PlanMill Ltd. is a leading provider of user-friendly web-based CRM, PROJECT and ERP Cloud solutions designed for the service business. We enable organizations to streamline business processes, improve control of their customers, personnel, projects and finance – while enhancing productivity and profitability. This entry was posted in Utilization and tagged calculate utilization. Bookmark the permalink.